I can’t think of a better summer project than a handspun, handwoven, and handstitched lavender sachet. All of the pieces are small and portable; you don’t need much yarn, and the finished product is one of those can’t-quit-squishing-it projects. I spun my yarn, some on my Sidekick and some on a spindle, while I traveled. I did my weaving (on a Zoom Loom ) and stitching in little bits of time while I waited for things: coals to heat up, my son to be finished with music or gymnastics, or a webinar to end. I could have swooped in and done it all in a day or a weekend, but I thoroughly enjoyed the slow pace of making this over a month. The yarns I spun were from Lisa Souza Australian Merino; this top is 16 microns, so it’s crazy soft. The colorway is a mixture of blues, purple, some green, and a shot of gold. I knew when I saw it that it would be perfect for this project. To make the yarn for the woven squares, I drafted woolen on my Sidekick and plied it to balance—I wanted it to be soft and fluffy. For stitching, I wanted a fine yarn with a tight ply twist, like sock yarn, so I spun it on a spindle. The same top made both yarns: for the stitching yarn, I pulled out a bit of just green fiber to spin for the stem and a bit of just purple for the lavender flowers. I wanted a subtle stalk of lavender stitched on my sachet, so I broke colors out of the colorway, instead of hunting for all new colors. Why such a tight ply twist? It’s not like I need durability in a stitching yarn. The tighter the twist, the more the stitched line is defined—the line raises up off of the background, physically and visually. Yarn: Three handspun yarns were used for this project. Tools: Zoom Loom, weaving needle, large-eye embroidery needle, scissors, dried lavender. Weave two Zoom Loom squares with yarn A. Wet-finish them, allowing them to full slightly but not felt. Using yarn B for the stem and yarn C for the leaves, stitch your lavender stalk on the public sides of one of the squares. I looked at a photo of a lavender plant and stitched freestyle. I used stem stitch for the stem and leaf outlines and lazy daisy stitch for the flowers. Pin the squares together with the right sides facing out. Using yarn C, stitch along the edge of the squares on 3 sides just inside the edge loops. I used running stitch, but you can choose any line stitch you like. Stuff the muslin bag with dried lavender (I used a lot less than I thought I would), knot the bag closed, and place the bag inside the sachet. Stitch the remaining side of the sachet closed. Right now my sachet lives in my purse so I can pet it, show it to every maker I come across, and walk around in a subtle cloud of lavender scent. But when the fall arrives, and my teaching travel starts up in earnest, I’m going to tuck it in my suitcase so that when I unpack in hotel rooms, I’m reminded of my little bits of summer making. Editor’s Note: When the dried lavender loses its scent, you can refresh with a few drops of lavender essential oil. Lavender has a reputation for helping people sleep, so it’s an especially good travel companion. We’ve taken a simple design and transformed it into an efficient and comfortable little loom. If you’ve ever woven on a pin loom, you’ll love our Zoom Loom. Small and compact, it’s easy to take with you. Weave anywhere, any time. Our Hi-Lo Spindles offer the best of both whorls: a brass hook at the top for high-whorl spinning and a grooved shaft for low-whorl spinning. Three sizes offer a broad spectrum of spinning capabilities: 3″ (2.2 ounces), 4″ (3 ounces), and 2″ (1.1 ounces). Our Hi-Lo Spindles are made of hard maple. I’m a new weaver and I’ve been told you can’t use knitting yarns for weaving. I have a Cricket Loom and would really like to use some of my knitting yarn stash to weave. You can definitely use knitting yarns for weaving—with a few caveats. You can use almost anything for the weft. The material (yarn/grass/plastic/paper) only needs to hold together long enough to be placed in the shed. There are three main factors to keep in mind when choosing a yarn for warp. First, it must be strong enough to sustain tension. To test for this, pull on the yarn. If it resists breakage, or breaks with a little “ping” it most likely will work for your warp. If the yarn just pulls apart easily, save this yarn for weft. Especially on the rigid heddle loom, avoid yarns, such as a hairy mohair, that will be what I call “sticky”. In other words, you don’t want a yarn that will catch on its neighbors because you will be constantly having to clear the shed and be vigilant about unintentional floats. The other factor in choosing yarns for warp, is choosing one that is not super stretchy, like an acrylic yarn. Again, you can use this yarn in the weft. Have fun with your stash! Easel Weaver Kits are now available! Check out your local Schacht retailer for pricing. 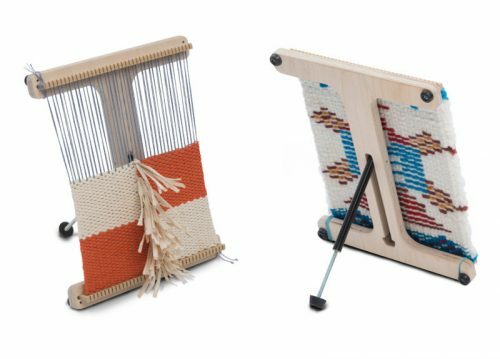 These kits contain all the tools you need to get started weaving!